Against the odds, a woman in Lahore Pakistan gave birth to six children it was revealed on Wednesday. On October 27, Sajida Qasim gave birth to a child on hospital grounds after the medical staff allegedly refused to admit her at the Dera Ghazi Khan’s Teaching Hospital. After being admitted she gave birth to four more baby girls and one baby boy. Sadly, one of the baby girls passed away. 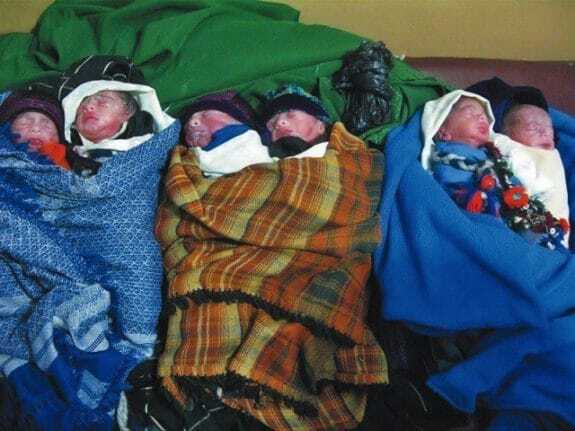 The five infants were transfered to the Children’s Hospital Nurse Ward where they are currently being cared for. Because of their low birth weights, doctors say they’re not sure if they will survive. The woman’s mother-in-law said that she had brought his pregnant daughter-in-law to the hospital after she went into labour. But instead of admitting her, the staff and doctors had asked her to bring admission slip and Sajida’s ultrasound report. “My daughter-in-law was suffering from labour pains and despite my efforts to admit her, the hospital staff refused to do so,” she told the media. “I had no other option but to lay her on the hospital ground where she gave birth to a baby surrounded by people,” she had added. Couple Expecting 3 Babies Welcomes 5!